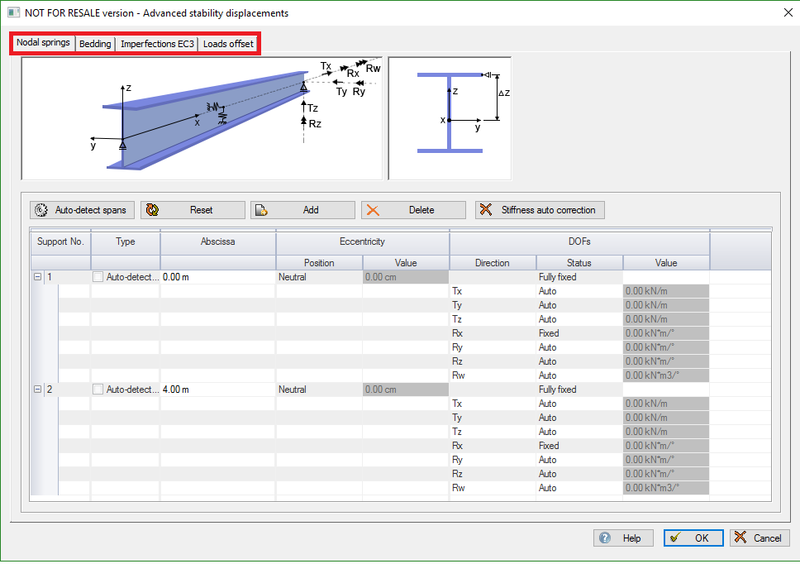 In order to perform second order analysis on steel elements in Advance Design, Steelwork Design “To calculate” option must be activated from the element’s property list. This feature is available either for each individual steel profile or for a multiple selection, by checking 2nd order with warping and imperfections checkbox, setting the Number of iterations and Stability 2nd order parameters. The "Advanced stability (2nd order)" parameters can be found in the Steelwork Design section of the property sheet for steel members. (1) Checking the "2nd order with warping and imperfections" box will perform the analysis of the selected members during the steel calculation sequence. (2) The 2nd order analysis being an iterative process , the user can set the maximum number of iterations. The 2nd order analysis uses the user-defined imperfections in order to determine the final 2nd efforts. The imperfections are applied step by step, incrementally, until the final imperfection defined by the user is achieved. At every iteration, the 2nd order efforts are recalculated starting with the previously calculated efforts. Calculations are made until convergeance - defined as the difference between 2 succesive iterations (automatically managed internally by the solver) - is achieved, or until the maximum number of iterations is achieved. (3) The "Stability – 2nd order parameters" will give access to a dialog where the user can define the various parameters to be considered during the analysis of the selected members.